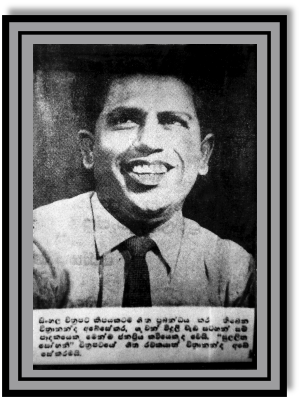 Chitrananda Abeysekera was responsible of creating many popular radio and movie songs. His ideas came to life with the participation of all most all the singers and musicians at his time. 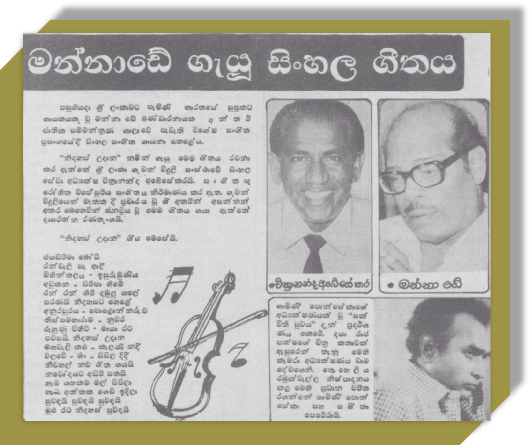 H. R. Jothipala, Dayaratne Ranatunge, Sanath Nandasiri, T. M. Jayaratne, Neela Wickramasinghe, Amara Ranatunge, Mauris Dhanayake, Sisira Senaratne, Al Haj Mohideen Beig, Indrani Senaratne, Nalini Ranasinghe, P. V. Nandasiri, Rohana Siriwardane, M. S. Fernando, W. D. Amaradewa, Bandula Wijeweera, Latha Walpola, Edward Jayakody, Chitra Somapala, Rupa Indumathi, Lakshaman Rodrigo, J. 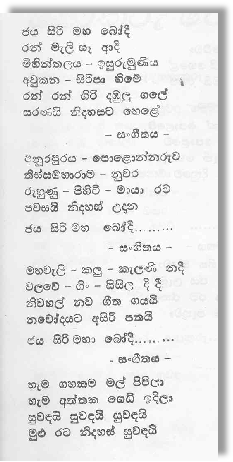 A. Milton Perera, Malini Bulathsinghala, B. Victor Perera, Niranjala Sarojini Peries, Swarnalatha Kaveeshwara, Milton Mallawarachchi, Rukmani Devi, Anjaline Gunathilake, Chandrika Siriwardane, Nanda Pathirana, Sujatha Atthanayake, G. S. B. Rani Perera, Dharmadasa Walpola, Christy Leonard Perera, K. Rani, Sidney Attygalle, Srimathi Rasadari, Chandra de Silva, L. M. Perera, Narada Dissasekera, and A. J. Kareem were given life to Chitrananda's poetic words. 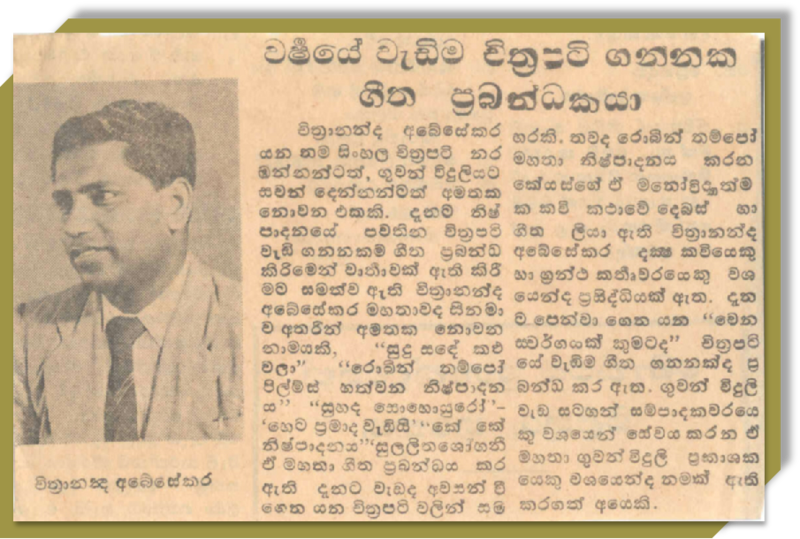 One time he was the leading movie lyricist however in 1966 he had to step down working for movies since Ceylon Broadcasting Corporation authorities banned their employees' involvement in the movie industry. But he continued writing songs for radio and eventually became one of the leading and popular lyricists in the island. 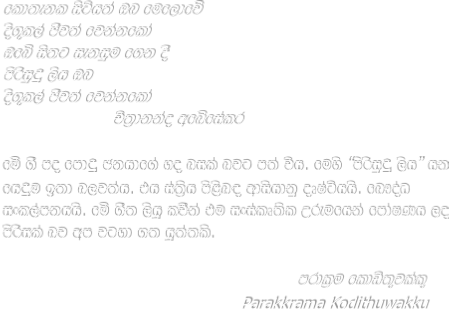 His book “Jaya Siri Maha Bodhi” consists of one hundred of his lyrics. For the last two thousand and three hundred years or so, the Branch of the Sacred Jaya Siri Maha Bodhi has flourished in the Maha Mevuna Uyana, Anuradhapura showering its benign blessing on the country and the people. Millions upon millions, local and foreign have venerated the sacred Bodhi at Anuradhapura and continue to do so with greater devotion. At a time like this, the appearance of Chitrananda Abeysekera’s “Jaya Siri Maha Bodhi” is timely, opportune and praiseworthy. 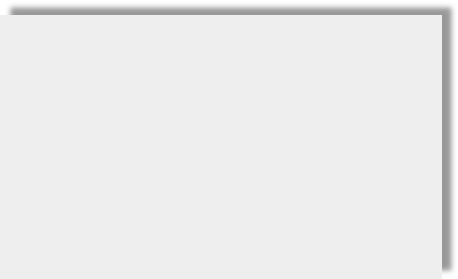 for Movies, please click on the appropriate box.